Geordan Murphy intends to continue playing for at least another two years, dismissing any suggestions that he would retire from rugby. Having overcome an ankle injury Murphy was included in Declan Kidney's 30-man squad for the World Cup in New Zealand but he started just one of Ireland's five matches - the opening victory over the United States. He saw 30 minutes of action as Ireland defeated Russia in their penultimate Pool C match but despite his lack of game time, the full-back believes he gained valuable experience during his time in New Zealand. 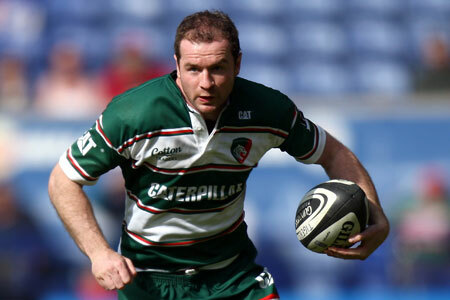 He will never represent Ireland in a World Cup again but the 33-year-old is confident he can help steer Leicester Tiger to more success and is determined to end his career on a high. "I want to hold up more silverware for Tigers before I finish up in a couple of years," Murphy is quoted as saying in the Irish Mirror. "Personally New Zealand was a good experience. It was a bit disappointing not to have gone further given the opportunity after beating Australia to get to a quarter-final and lose to Wales was disappointing. "But on that day they deserved the win. We got beaten by the better side on the day." Murphy never expected to be included in the Irish squad after he was struck down by a career-threatening ankle injury, but he fought back to fitness and he was delighted to get the chance to play in a World Cup. "It was a difficult year for me in that I got a particularly bad injury in January and I was told then I wouldn't have much chance of making the World Cup," he went on. "Obviously as a stubborn person I set my goals on making it and being fit enough to get selected. "It was a pretty intense summer of training for me, a lot of hard work, and it looked like I was going to miss out.